At the close of the sixteenth century, despite Protestant attempts to discourage popular devotion to saints and shrines, the Roman Church in Bavaria initiated a propagandistic campaign through the publishing of pilgrimage books and pamphlets. Philip Soergel's cogent exploration of this little-known pilgrimage literature yields a vivid portrait of religion before, during, and after the Reformation and Counter-Reformation. These "advertisements," combining testimonies of miracles with fantastic legends about shrines, fueled the conflict between Catholics and Protestants and helped shape a distinctive Catholic historical consciousness. 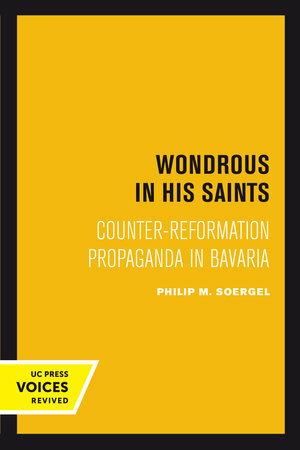 Soergel stresses the power of the printed word as a defense of traditional authority, testing other historians' assertions about the neglect of printing and literacy in the Counter-Reformation. This title is part of UC Press's Voices Revived program, which commemorates University of California Press’s mission to seek out and cultivate the brightest minds and give them voice, reach, and impact. Drawing on a backlist dating to 1893, Voices Revived makes high-quality, peer-reviewed scholarship accessible once again using print-on-demand technology. This title was originally published in 1993. Philip M. Soergel is Professor and Chair of the Department of History at the University of Maryland.